We recently received a few pictures from one of our readers in Wisconsin. 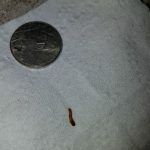 She sent photos of a worm-like organism she noticed near her dog’s bed. 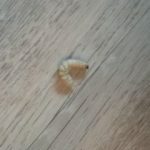 She is curious if it could be a flea larva, or if it is something that just wandered in (they live in an old house.) She said that her dog doesn’t really scratch, but she still isn’t sure what to think of the specimen! The photo shows a specimen with a segmented body and 3-4 tiny prolegs. 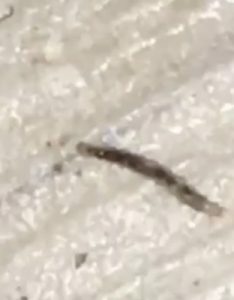 It looks translucent in some places and has a dark brown head. Could this be a flea larva? 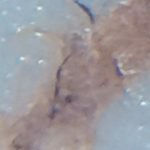 We believe that this isn’t a flea larva. 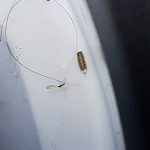 We think it is some type of beetle larvae, but we aren’t sure the species. As long as our reader hasn’t found a bunch of these, she can assume that it just wandered in to escape the Wisconsin winter! We don’t think it is something to worry about. 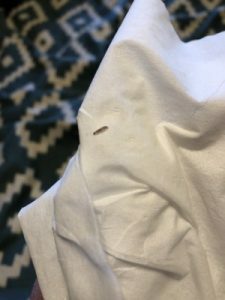 To wrap up, we believe the larva our reader found near her dog’s bed is a beetle larva, not a flea larva. If she is worried about her dog having fleas or is concerned about his health, we recommend she take him to the vet! 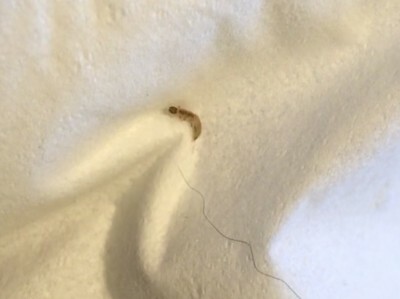 We believe the larva our reader found near her dog's bed is a beetle larva, not a flea larva. If she is worried about her dog having fleas or is concerned about his health, we recommend she take him to the vet! 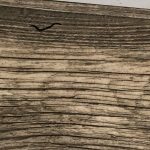 What Is White Worm on Carpet?